Although the beer will regularly retail for $10.45 for a 6-pack, a case will only cost $6.60 (including deposit) from Friday to Sunday, to celebrate the first long weekend of the year in Ontario. Even the "No Name" brand which is traditionally considered the cheapest, no extras, minimal marketing brand can't regularly sell their product at $1. A regular price of $1.64 per bottle (not including deposit) for the "No Name" brand just goes to show how infeasible a $1 per bottle price is. Ontario’s sole remaining buck-a-beer brewery is scaling back its dollar suds to long weekends only. Cool Beer Brewing Co. of Etobicoke has informed Premier Doug Ford’s government it will raise the price of its lager to $1.25 per bottle effective Feb. 11, corporate development officer Kevin Meens told the Star on Tuesday. The brewery where Premier Doug Ford launched his buck-a-beer challenge just hiked its price. A buck a beer toasted by Premier Doug Ford this summer is now selling for $1.65 per can. Barley Days Brewery, in Picton, Ont., launched its Loon Lager brand after Ford's government lowered the minimum price of bottles and cans of beer to $1 in August and launched its "buck-a-beer challenge," which offered participating companies perks like prime spots in LCBO stores. The price hike means only one brewery — Etobicoke's Cool Beer Brewing Company — is selling $1 beer, according to the LCBO website. Ford and the PC Party campaigned about bringing back "buck-a-beer" from the early 2000s, and they allude to the Liberal government as the reason it's gone for introducing the minimum price as a way of "lining the pockets of foreign multinational brewers and protecting the monopoly of the Beer Store". The references to the early 2000s "buck-a-beer" days had brewers making beer at a regular price of or near $1; not just promotional prices. There was no talk from his campaign about buck-a-beer being limited to promotional deals, and they also claimed it would increase competition and encourage brewers to lower their price, but this doesn't seem to have had any noticeable or noteworthy effect. This policy Doug Ford was pitching to Ontarians misrepresented the known reality and they did very little, if anything, to correct that and continued to reinforce that misrepresentation. They ran ads that literally stated "VOTE CHEAPER BEER" (https://i.imgur.com/fAqNnuS.jpg) but the policies they were promoting had no real effect on current beer pricing. They also campaigned that it would not cost anything, but in order to get any brewers on board, they had to entice them by providing free advertising and premium shelf space in LCBOs which results in fewer advertising dollars and sales of profitable products. 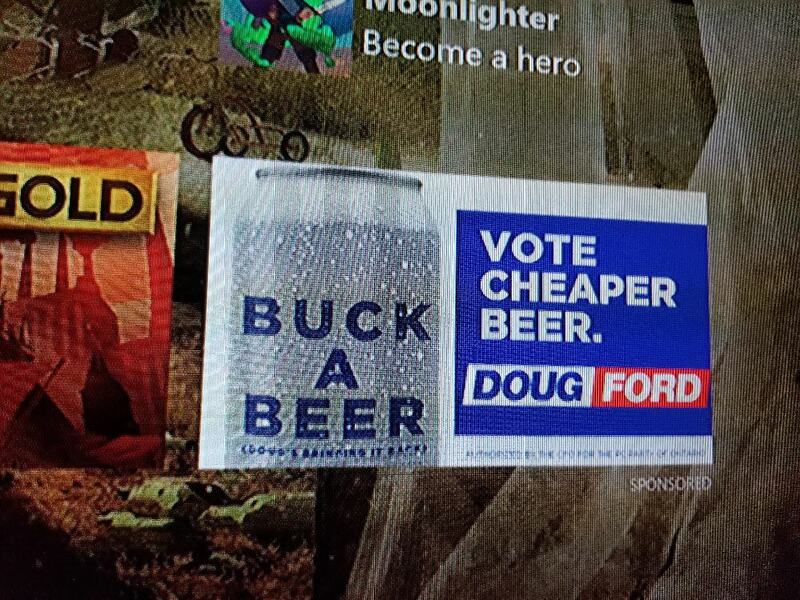 Doug Ford, the PC Party, and their supporters, campaigned significantly about bringing "buck-a-beer" back. They harken back to the days where some cheaper quality beer was sold at a regular price of $1, and that they will bring this back by introducing this policy. And when pointed out that this policy will likely be ineffective in producing this outcome, they ignored it, handwaved the criticism away, and continued heavily campaigning on the same idea. Cheaper beer was not delivered in any meaningful, significant way. As such, this promise is considered broken. This Labour Day weekend, three different brands of beer will available to the people of Ontario for just $1 a can (plus tax, deposit, and various social, health, education and environmental programs). Come Monday, however, that number will drop down to two when President's Choice exits the game — only a week after entering it in the first place. A loonie can now buy you a can of beer in Ontario — that is, if you can find some. Just three brewers have signed up for Premier Doug Ford's buck-a-beer challenge ahead of the Labour Day weekend, and a limited number of LCBO and Beer Store locations are stocking the product. This is a pretty poor showing for "buck-a-beer", and not terribly close to the image portrayed by Doug Ford and the PC party. We'll sit on this for a bit and see if more brands take advantage of this and how long this promotion lasts before ruling on this promise. Doug Ford: "My friends, we're going to do our part because a buck-a-beer is coming to a shelf near you." Just another reference to recent promotional material pushing the idea that beer will have a $1 shelf price.